Picnic & Barrel Auction Archives - Write for Wine: It's Wine O'Clock Somewhere!Write for Wine: It's Wine O'Clock Somewhere! One of our favorite summer events is the Auction of Washington Wines, a glamorous and fun weekend that benefits Seattle Children’s Hospital and the Washington Wine Education Foundation. This August marks the 27th year of the event, which has raised more than $30 million since 1988. 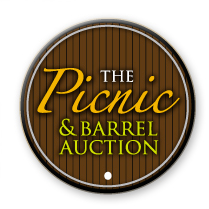 The weekend kicks off early with the Picnic & Barrel Auction at Chateau Ste. Michelle on Aug. 14, beginning at 4 p.m. We have attended the picnic for the last few years, and always have such a good time tasting the fine wines of Washington state, talking to winemakers and bidding on some futures. 2014 Barrel Auction participants include: Adams Bench, Andrew Will Winery, Avennia, Baer Winery, Boudreaux Cellars, Buty, Cadence, Double Canyon, Efeste, Fidelitas, Hedges Family Estate, Kevin White Winery, Result of a Crush, Reynvaan Family Vineyards, Sleight of Hand Cellars, Sparkman Cellars, Spring Valley Vineyard, Va Piano, Walla Walla Vintners, Woodward Canyon and others. More than 30 additional Washington wineries will also be pouring wine during the picnic. And what would a picnic be without great bites? Chefs from the Tulalip Resort Casino will provide gourmet fare to pair with the wine, including tents devoted to cheese and a themed dessert station. In one evening, 10 dinners featuring winemakers will take place at private locations around the Puget Sound. Enjoy a gourmet meal created by a guest chef paired with fabulous Washington wine. The Columbia Winery Charity 10K Race and 5K Run/Walk & Kids Dash (formerly the Covey Run) provides fun for the whole family through a scenic course through the heart of Woodinville wine country. The event will also feature food, beverages, kids’ activities, music and more. A featured Washington State winemaker will be seated at every table. 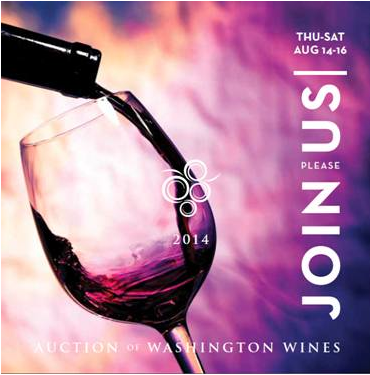 Tickets for all events are available at the Auction of Washington Wines website. August brings one of our favorite summer wine events — the Auction of Washington Wines and its Picnic & Barrel Auction on the scenic grounds of Chateau Ste. Michelle Winery. On Aug. 15, more than 100 creative Washington state winemakers will be on hand, along with the talented chefs from Tulalip Resort, to provide fine wines and tasty treats. Talk about a gourmet picnic! Notably, the largest and most prestigious selection of limited production bottles will be sold to the highest bidder, with proceeds going to Seattle Children’s Hospital and Washington State University’s Viticulture and Enology Program. As you wander through the beautiful lawns, winemakers will be pouring their recent releases and more than happy to chat about Washington wine. So this is truly an event for both experienced wine enthusiasts and novices alike. And if you want more tastes, barrel samples of yet-to-be-bottled wines are also available at the Barrel Auction. When you find one you like, place your bid on a case. The top-five highest bids for each winery will take home a medal, and be the first to receive the wine when it is released. At the Auction of Washington Wines website, you’ll find a full list of wineries participating in the auction, wineries pouring to guests, and the samples on the restaurant menus, along with an easy way to purchase tickets to an afternoon of fun and worthy causes.